Do You Brown Bag It? The Triangle Modern Quilt Guild has put forth the “Denyse Schmidt Paper Bag” challenge. The challenge is to create something using two fabrics, along with any other solids in the same color family and one neutral solid. Last week, I reached into two brown bags and picked up these two rolls of fabric. No peeking was allowed! I lucked out by getting two fabrics that look pretty good together. That will make the design process easier. The challenge got me thinking about using the paper bag with my current project: a postage stamp doll quilt. 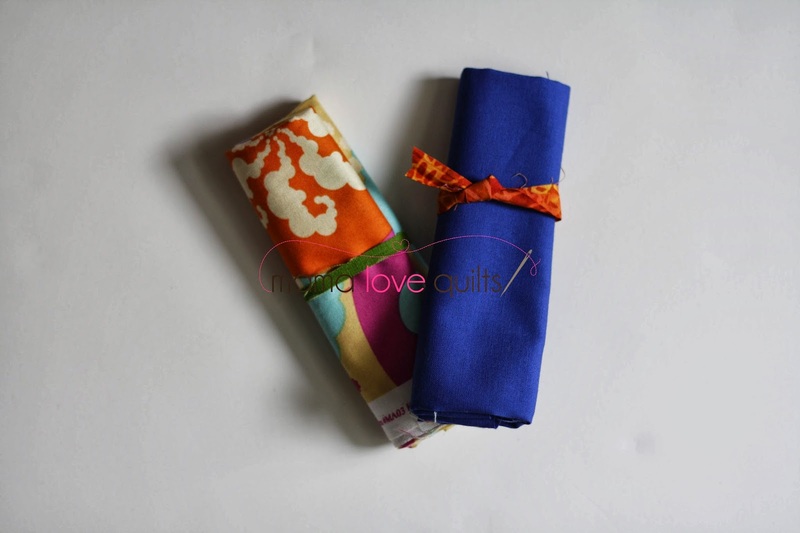 Denyse Schmidt recommends using a paper bag to help with deciding which fabrics to sew together. 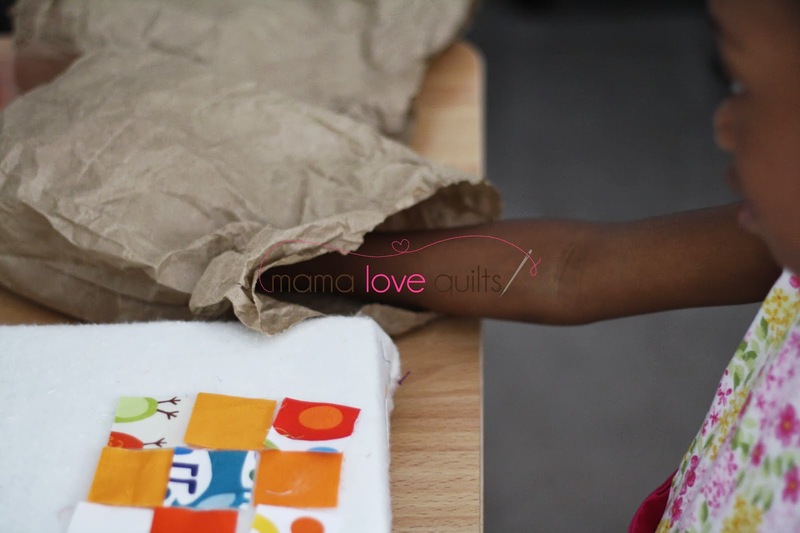 You place the pieces of fabric that you are going to use in a paper bag and pull out pieces without looking and sew them together. I gave it a try this weekend and loved it! I put the light squares in one bag and the dark squares in another bag. It was fun not knowing what I would pull out of the bag. Here’s a peek inside the bag. I even got my little girl involved in the process. I’m looking forward to stitching this one up! 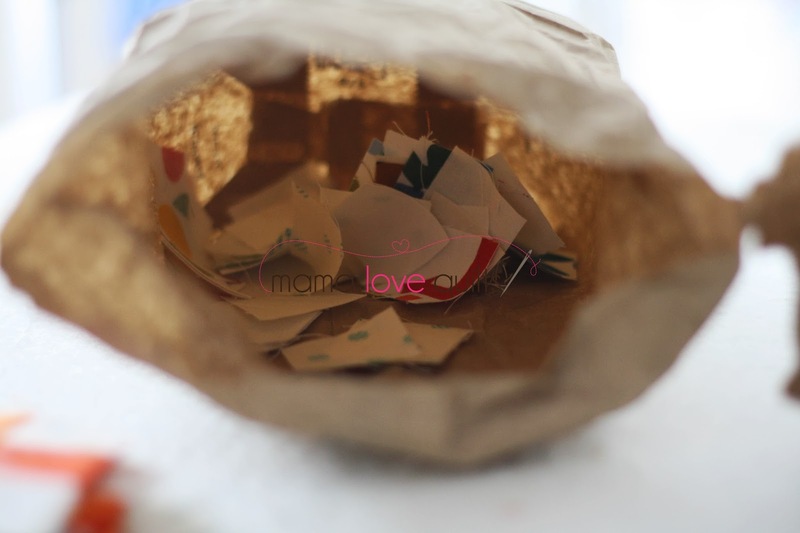 If you’ve never used a paper bag when piecing, I encourage you to give it a try. If you have used this technique, what was your experience like? Looks like it was fun for both of you! Thanks for sharing this great idea. Can't wait to see the results! I've done the bag technique a few times, the hard part for me was sewing together 2 scraps that were identical, but it does give you a nice random look! Can't wait to see your finished project! I've done it a few times and I love the results. There have been a couple of times I cheated and put something back to draw again, but for the most part, I've been completely satisfied and it makes being random easier than trying–that's for sure! I am horrible at random, just plain can't make myself do it. So last year when I was attempting to make a random quilt I actually tried this and loved how it turned out. I'm working on another one right now using a brown bag too. I like how it keeps all the pieces contained and helps me mix it up. Yes I do sometimes. I find it hard to be random and this technique certainly helps. Clever idea, but even better is that your daughter helped! What a great idea, certainly would help break out of some old fabric matching habits. LOVE Denyse and the brown paper bag! I don't brown bag it, but that's probably because little squares bring me out in hives ;o) Great effect though!